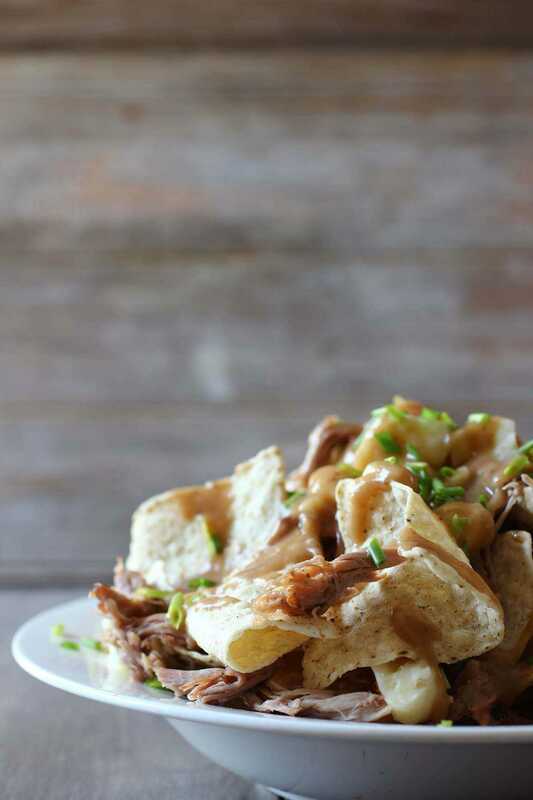 The Best Stacked Pulled Pork Poutine Nachos. Crispy tortilla chips covered in pulled pork and a rich gravy make these poutine nachos epic and hunger-busting! I really wanted to squeeze in another game day recipe for Super Bowl Sunday and you’re going to love this one, It’s everyone’s favorite sports game snack. Tortilla Chips covered in rich brown gravy, cheese and smoky pulled pork. I give you Poutine Nachos. Traditional poutine is a Canadian recipe, made of french fries and topped with cheese curds and gravy. It doesn’t exactly sound gourmet but it’s total comfort food at it’s best. I tried it in Vancouver and it actually reminded me of a popular post-pub snack from back in Scotland, minus the cheese. It’s the perfect game day food- like these Fried Chicken Sliders– but seriously, who wants to be stuck in the kitchen making fries when the game is on? Nachos aren’t something you eat everyday. But when you do, they have to be dripping with sauce and packed full of ingredients that’ll pop the button on your pants. 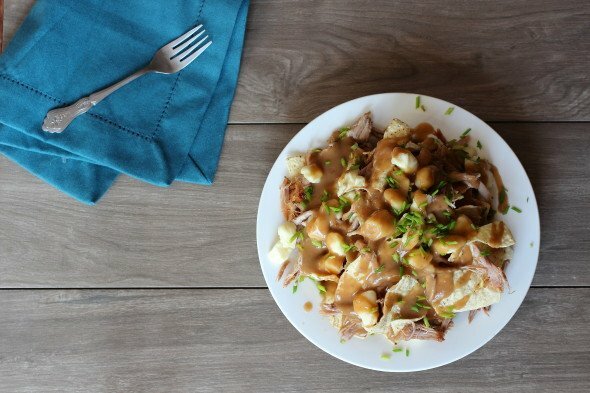 Usually cheese sauce is used but my nachos have a beef gravy instead covering the famous cheese curds that make poutine what it is. The curds are similar to mozzarella and become gooey soft when the hot gravy is poured on top. You could serve the nachos just like this and you’d still blow people away with the taste, but add some pulled pork and you’ve created the best nachos ever! Pulled pork does takes a while to cook, but I put it in the oven before I went to bed and it was perfect in the morning. A little weird waking up to the smell but so worth it, and with the extra pork you can make some pulled pork sliders! Rub the pork all over with the dry BBQ rub. Place it into a medium sized dutch oven or ceramic pot. Add the apple juice, liquid smoke and Worcestershire sauce. Place the lid on the pot and put it into the oven. Bake for 6 1/2-7 hours testing with a sharp pointed knife. It should pierce the meat easily. 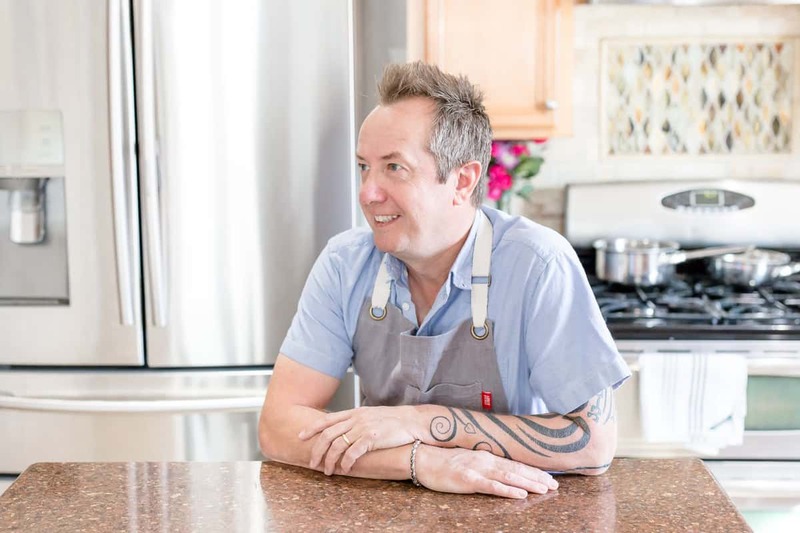 Transfer the pork to a plate and let cool for 20 minutes. Shred the pork until all that is left is the fat which you can discard. In a medium sauce pan, melt the butter until bubbling. Add the flour and whisk until it starts to turn a light brown color. Gradually add the stock a ladle at a time, whisking well after each addttion and making sure there are no lumps in the gravy. Once all of the stock has been incorporated, keep the gravy on a very low heat, whisking occasionally to prevent lumps. Place some tortilla chips into a bowl or large plate. 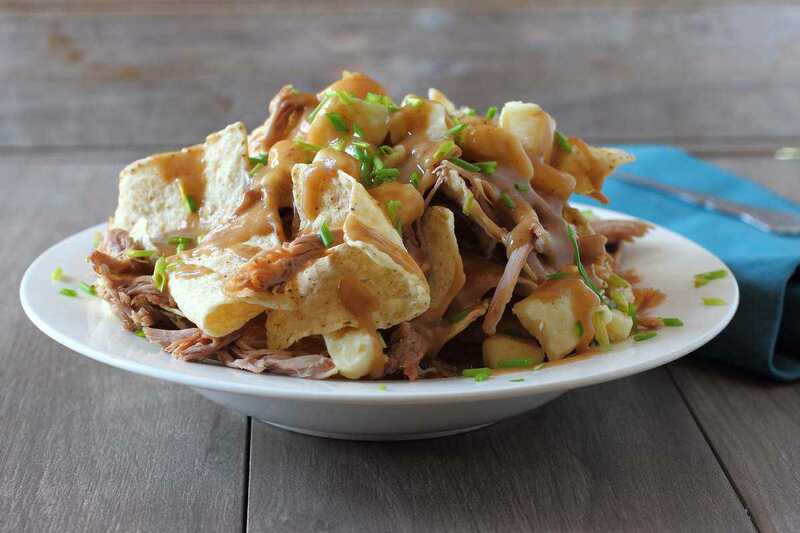 spread some of the shredded pork over the chips followed by some cheese curds. Carefully pour over a little of the gravy covering the pork and cheese. Place another layer of tortilla chips on top of the first layer and repeat the method, finishing with a generous pouring of the gravy. Finally garnish with the chopped chives and serve at once. Cheese curds can be hard to find in some states. You can replace them with chunks of mozzarella or farmer cheese. well now, these do look pretty fabulous!!! This is my kind of game-day food. Gerry, you’ve out-done yourself. This looks fabulous! My husband wants to know what time he can come over? These are on his wish list! They are lovely nachos indeed. Tricia, you’re going to have to make them for him! Now that’s the way to eat nachos. I love every single thing about this!!! 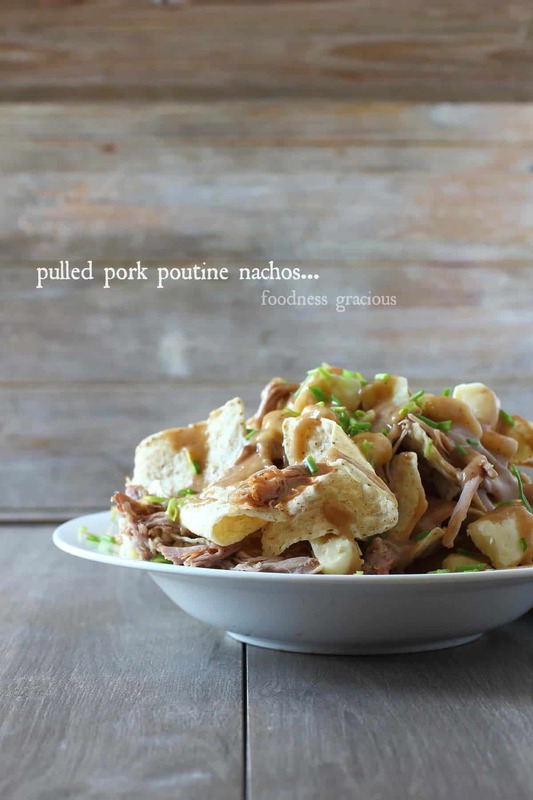 Hmmm, could I be the creator of poutine nachos Greg? Now THIS is how you do nachos! Carrie, they were so good! Those are some good looking nachos! 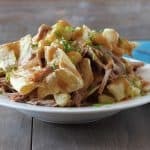 I’m from Quebec, Canada..where the original Poutine was invented in the early 50’s…I must say I’ve had all kinds of them (believe me, there are tons of kinds of poutine out here)..but THIS…amazing! So different, so original! I would never have thought to make Poutine without the fries! I will definitely be making this again! Thanks so much for sharing!